to the analog world. Call us with your requirements. Click checkboxes and set quantity box to select items for your shopping cart. When finished, click "Add to Shopping Cart" button below to add items to shopping cart. on any multipair fanout by adding SS to the part number. � One 1/4" TRS plug wired to two 1/4" TS plugs. � Choice of 5, 10, 15, and 25 ft. lengths. We also manufacture multitrack insert snakes. 15, and 25 ft. lengths. formed by ST + length. (1', 3', 5', 10', 15', 20' and 25'). The Medusa Multitrack (MT) Series is designed to interface multitrack recorders or outboard equipment to mixing consoles. Each Multitrack Medusa is constructed of Whirlwind multipair cable with a heat-shrunk fanout at each end, and is available with optional Snakeskin® . An alternative construction uses individually jacketed (IJ) Canare wire with Snakeskin® fanouts standard. 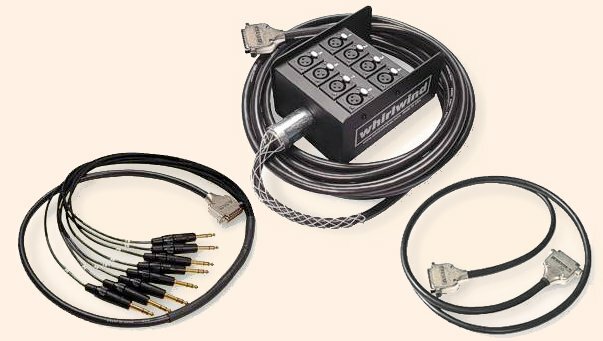 Choose from 8, 12, 16, 24 or 32 line configurations (other channel counts available special order) and Whirlwind XLRs, RCA Phono plugs or 1/4" TRS plugs. Each fanout can be specified with distinct connector types and signal polarity. When the same type of connector is specified at each end, wiring is pin to pin. Wire mesh hanger grips can be ordered as an option. Click checkboxes and set quantity box to select items for your shopping cart. When finished, click "Add to Shopping Cart" button below to add items to shopping cart. 15 ft as marked below. 25 ft. 50 Ft.